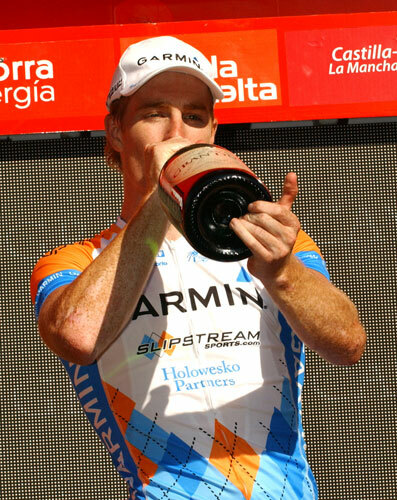 A long acceleration by American Tyler Farrar earned the Garmin-Slipstream sprinter the first major Tour stage win of his career in the Vuelta’s stage 11. Overall, Valverde still leads. Farrar was able to take advantage of the hard work done by Liquigas in the final kilometres and blast away with around 200 metres to go for a convincing win. Up until stage 11 German Andre Greipel and his Columbia-HTC team had dominated in the Vuelta’s sprints. But American clearly had suffered far less than Greipel on the first and second category climbs earlier on the 200 kilometre leg from Murcia to Caravaca de La Cruz. In fact, Columbia-HTC were barely visible on the front in the final hour, with Rabobank and Liquigas taking responsibilities instead. The ultra-long straightaway leading to the finish saw Fabian Cancellara (Saxo Bank) making one of his favourite last-ditch efforts on a slight rise just before the last kilometre. But the Swiss rider did not have the legs to go clear and a bunch sprint became inevitable. Overall there was no significant change, although one pre-Vuelta favourite, Frank Schleck (Saxo Bank), opted not to start because of a recurrring knee injury. Fifth in the Tour, Schleck will now not be taking part in the World Championships. As the Vuelta reaches its second rest day, overall Alejandro Valverde (Caisse D’Epargne) remains in command of the race, but Cadel Evans (Silence-Lotto) is just seven seconds behind and Robert Gesink (Rabobank) is at 36 seconds. “There’s everything to play for now,” Evans told Cycling Weekly at the start of the stage. Tomorrow (Thursday) is the Vuelta’s second, and final, rest day. 10. Matteo Tosatto (Ita) Quick Step all same time.